The San Antonio Spurs kept up their perfect record in the playoffs and posted a 18 game winning streak as they swept the Los Angeles Clippers. Winning 102-99 in LA, the Spurs were led by none other than Tim Duncan. Seemingly hell bent on adding another ring to his collection, Duncan scored 21 points and added 9 rebounds. Tony Parker filled out the usual suspects alongside Manu Ginobli who had 17 and 11 points respectively. Chris Paul had a big game with 23 points and 11 assists, as well as 6 rebounds. Blake Griffin also had 21 points. A 24-0 run from the veteran Spurs left the Clippers faithful wondering what could of been as the Spurs topped the Clips yet again to take a more than likely insurmountable 3-0 lead. 28 points from Blake Griffin however was a reassuring sight for the future. For now however, Tim Duncans 19 points and 13 rebound game, complimented by 4 assists, will come out on top. Still youthful guard Tony Parker added 23 points and 10 assists. Whilst it looks likely that the Clippers will be leaving these playoffs in a sweep, this can be nothing but a positive season for this young team. Griffin playing against the master himself in Tim Duncan, in playoff time, is a huge learning experience for the young man. 41 points from the Los Angeles Clippers bench, including all but two of the teams fourth quarter points, helped the Clippers secure a second round berth as they beat the Grizzlies 82-72. Nick Young and Kenyon Martin scored the bulk of the points for the bench with 13 and 11 points respectively. But it was Chris Paul once again who led all scores for the Clips with 19 points and 9 assists. — Clippers’ guard Eric Bledsoe, who had eight points off the bench. Both Rudy Gay and Marc Gasol did all they could for the Grizzlies, scoring 19 points each, as they top scored for the Grizzlies. But apart from that, the Grizzlies did not recieve much more help as no other player scored in double figures. A dissapointing loss for the Grizzlies, especially after last years wonderful first round against the Spurs, but there are positves. Marc Gasol has emerged as a scorer during this series, ofthen carrying the majority of the load. The combination of him and a healthy Zach Randolph could very easily form a front court to fear. For the Clippers, it’s all positve, proving that the trade for Paul was a smart one for now and the future. 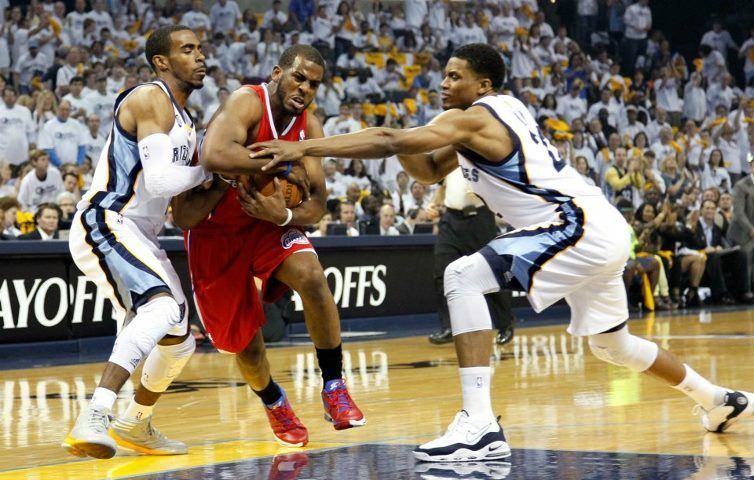 The Grizzlies evened the ledger against the LA Clippers as they forced a Game 7 on their court by winning in LA 90-88. Marc Gasol again stood up tall as he posted a 23 point, 9 rebound game, but Zach Randolphwas the star of the show as he took over with 18 points and 16 rebounds, including 6 offensive boards. In a hectic finish, Rany Foye stepped out of bounds on a missed free throw but quickly made up for it with a big three to bring the Clippers within 2 points but a smart play from Marc Gasol finished them off. Proving he has a basketball brain, Gasol quickly inbounded the ball while the CIippers will still celebrating/matching up. Mike Conley raced down the court and by the time a single Clipper got near him, the clock had expired. Now the Clips face the prospect of losing a series after securing a 3-1 lead. Things are much different this time around for the San Antonio Spurs. This time they’re not limping into the playoff but instead have all their superstars healthy and raring to go. Tony Parker is playing MVP basketball, Manu Ginobli has embraced his new role off the bench with vigor and Tim Duncan is doing the same he has for years, if only slower. The Jazz have the tall timber that could bother the Spurs in Al Jefferson and Paul Millsap brusing their way through the lane. With no true defensive center left in San Antonion, this is where the Jazz can win the series. But the electric offense of the Spurs should be too much for the Jazz. Expect a reasobably easy series win here. Surely the Thunder were hoping for an easier first round matchup than with the reigning champs. Championship experience runs deep in the roster and the Mavericks pose a real threat to the Thunders potential championship run. But the absence of defensive anchor Tyson Chandler, who now makes port in the Knicks key, will seriously effect the Mavs chances. Whether ageing center Brendan Haywood can stand in the way of the likes of Russel Westrook and Kevin Durant will hold one of the main keys to the series. Also, Serge Ibaka will have to stay with Dirk Nowitzki. Same thing with Shaun Marion on Kevin Durant. It’s there for the Mavs to win, but the Thunder will probably go on to the second round out of this one. Well the Lakers got here. And if it wasnt for Ron Artest’s flailing elbows, they would of arrived in one piece. Playoffs seem to turn this team into another creature. It’s said so often, but the Lakers are built for the playoffs. Andrew Bynum and Pau Gasol give them unmatched size and now with Ramon Sessions running the point, there’s even an element of speed in Lakerland. However, Sessions’ number one task will be to slow down rocket point guard Ty Lawson, who could very well claim to be one of the All Stars of the second half of the season. But Bynum’s improved low post play and rebounding will be the key here. There’s simply noone who can match up with him in the league, let alone on the Nugget’s roster. Look to him to have a big series and possibly an opinion changing playoffs as the Lakers get the win here. The Clippers gave up homecourt advantage in the dying stages of the regular season and that could very well make all the difference as the Grizzlies building is one of the more hostile environments around the league. It’s a difficult building to win in, as the Spurs showed last time around. Chris Paul and Blake Griffin form a dangerous duo and one that could very well win the series for the Clippers. However, if the bustling Zach Randolph can get Blake into foul trouble early, then the Clippers could be in a bit of trouble. Paul is one of the better clutch performers in the league and the matchup between him and Tony Allen during crunch time is something to look forward too. The Clippers don’t really have anyone to match up with Rudy Gay, the hard running and slashing guard likely to cause some headaches for the Clippers. This one is almost too close to call, but the edge goes to Lob City in this one. The Charlotte Bobcats have once last chance. One final chance to avoid going down as the worst team in NBA history as they lost to the Orlando Magic. J.J Redick’s career high 31 points helped push the ‘Cats closer to the edge of NBA lore. DJ Augustine had 23 points as well as 6 assists but it was not enough to get the Bobcats a much needed win. Despite Dwight Howard’s absence, the Magic have sealed the 6th seed in the playoffs. However, they suffered yet another injury blow with Glen Davis going down with an ankle injury. The injury leaves Ryan Anderson as the only man of considerable height going into the game against Memphis. The Wizards owned the middle of the game as John Walls phenomenal performance lifted them to heir longest winning streak since 2007. Wall well and truly filled up the box score registering 23 points, 7 rebounds, 13 assists and 7 steals as he tore through the Cleveland defence. Potential Rookie of the Year Kyrie Irving only played 6 minutes in the Cavaliers final match for the season. Only two players scored in double figures for the Cavs, with DJ Kennedy leading them with 12 points. After the match, Atawn Jamison announced that he would not be resigning with the team when he is a unrestricted free agent this summer. It will be interesting to see which teams show interest, as the veteran has shown that he can still offer something this year with the Cavaliers. With the playoffs around the corner, a win against a fellow Eastern Conference playoff team was no doubt a confidence boost as the Chicago Bulls took down the Indiana Pacers. Carlos Boozer looked set for a big night after 10 points in the first quarter alone, but it was Kyle Korver who led the Bulls with 20 points off the bench. Reigning MVP Derrick Rose only scored 10 points on the night, his match fitness and form the greatest concern for the Bulls as they head into the playoffs. Lance Stephenson, filling the gap that the absent Danny Granger left, top scored for both teams as he had 22 points. Granger was out resting a sore knee and will be back before too long. 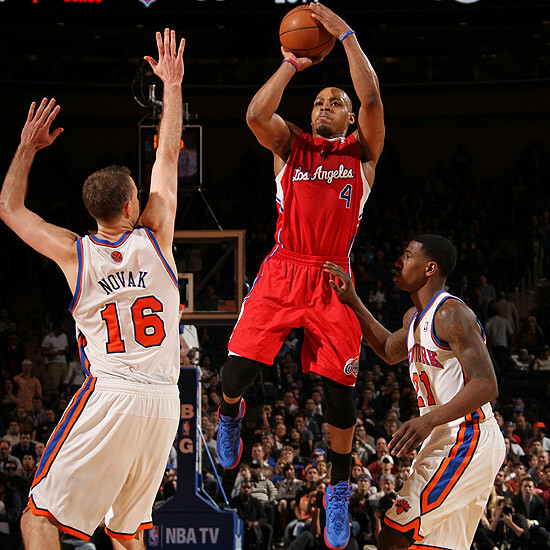 Chris Paul sat out the game as the New York Knicks continued to get their front court tandem clicking as they seemed to warm towards the playoffs with a win over the Clippers. With the loss, the Clippers fall 1/2 a game behind the surging Memphis Grizzlies for the fourth seed, who could very well steal the once seemingly safe Clipper home court advantage. 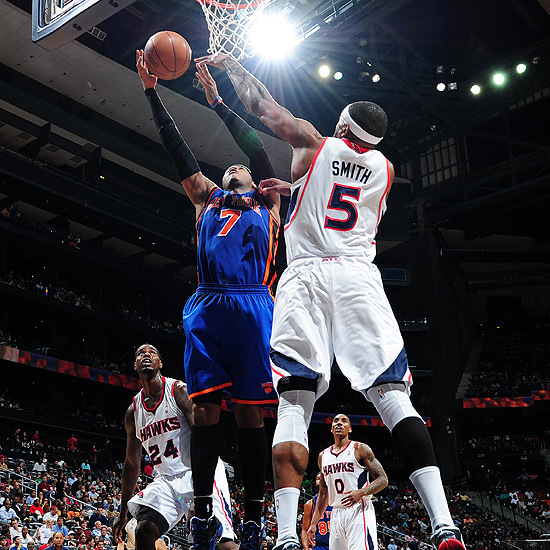 JR Smith ended up being the driving force off the Knicks bench, scoring21 points. Blake Griffin had 29 points on 11-14 shooting while Randy Foye had 28 but shot much more poorly, only connecting on 9 of his 23 shots. Evan Turner’s big 29 point game gave the Philadelphia 76ers the win as Andre Iguodala sat out for the Sixers. Luo Williams and Thaddeus Young also sat out as the Sixers started preparing themselves for the rapidly approaching playoffs. The Bucks on the other hand also rested most of their stars in their second last game of the season, with Monta Ellis, Ersan Ilyasova and a few others sitting the game out.Brandon Jennings led the Bucks with 19 points as well as 6 assists. Kevin Durant had 32 points while Russel Westbrook had 30 points and 9 assists as the Oklahoma City Thunder overcame 25 points from Ty Lawson to win against Western Conference competitor Denver. Serge Ibaka blocked 4 shots to further strengthen his claim for Defensive Player of the Year. Derek Fisher also had 9 points off the bench for the Thunder. In what was possibly Steve Nash’s final game for the Suns, they were not able to get the win as they lost by four points against a Spurs team that was resting its big three for the playoffs. Australian Patty Mills had 27 points as he was handed the start against premier point guard Steve Nash. Shannon Brown had 21 to lead the Sun while young big man Tiago Splitter had 26 points in only 19 minutes of play. 25/4/2012-Hawks take step towards home court advantage as Jazz claim final playoff spot. While Chris Paul and Blake Griffin combined for 70 points, no other Clippers players reached the double figure mark as they lost to the Atlanta Hawks. Joe Johnson had 28 points including 6-8 from behind the three point line as the Hawks edged closer to home court advantage against the Boston Celtics. However, with the loss, the Clippers lost the Pacific division title to the Los Angeles Lakers. The Boston Celtics 2nd team beat the Miami Heat reserves as the stars for both teams sat out. Kevin Garnett, Ray Allen, Rajon Rondo, LeBron James, Dwyane Wade and Chris Bosh all were absent while Paul Pierce only played minimal game time as the bench players for both teams were forced to step up. Aleksander Pavlovic was the standout of both teams, with 16 of his 18 points coming in the final quarter. 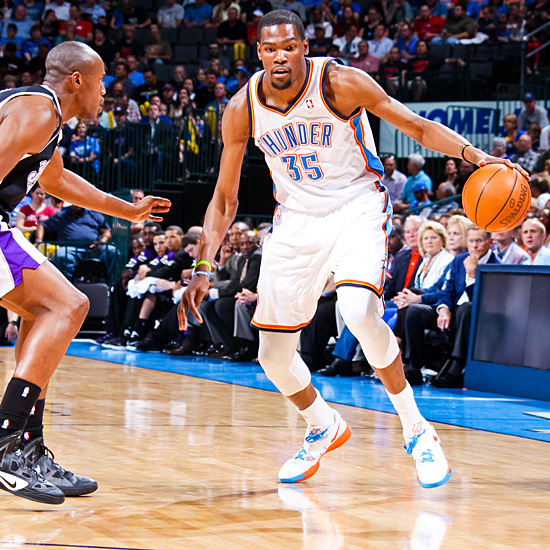 All five starters scored in double figures for the Kings but Kevin Durant’s 32 points led the Oklahoma City Thunder to the win. DeMarcus Cousin’s also had 32 points to match Durant, but it wasn’t enough as Durant’s big game kept him in the running for the scoring title. The chaotic race to the end of the season continued as the Utah Jazz officially claimed the final playoff spot up for grabs with a win over the Phoenix Suns. The Jazz eliminated the Suns with a 12 point win at home. Paul Millsap had 26 to lead all comers and was absolutely dominant throughout the game. Marco Belinelli hit the go ahead layup with 0.7 seconds remaining as the New Orleans Hornets won against the Golden State Warriors. Belinelli had 23 to lead both teams as Klay Thompson led the Warriors with 16 points. Mike Woodson was given yet another quandary in the seemingly endless drama in the Big Apple as the Knick’s got the win against the Hawks. With Tyson Chandler sitting the game out, Amare Stoudemire played his seemingly preferred position at the center, with Carmelo Anthony filling the power forward position. Whilst the Knicks were worse defensively, they got the win and Melo and Stat combined for 51 points, the kind of numbers Knick fans are more than happy to see. Which leaves Woodson with the question: Can all three of his potential All Stars play well in the same front court? Serge Ibaka had 18 points 14 rebounds and 7 blocks but it was not enough as Kobe Bryant had 28 to lead the Lakers to a double overtime victory over the Thunder. However the biggest talking point of the night would end up being Metta World Peace’s elbow to the back of James Harden’s head. Looking much more like the Ron Artest of old, World Peace slammed his elbow into Hardens head with enough force to knock the man to the ground. Will be very interesting to see the type of punishment handed out by the league. DeMarcus Cousins played big as the Sacramento Kings completely eclipsed the Charlotte Bobcats, winning by 26 points. Cousins had 29 points and 10 rebounds but perhaps Tyreke Evans was the real star of the show as he had 22 points on 10-11 shooting, including three assists and 2 steals. The Heat scored 31 points in the fourth to overwhelm the Rockets 19 points as LeBron James’s 32 points lifted the Heat. With the loss the Rockets are no longer in playoff contention, despite Chandler Parsons’ 23 points. 40 points from the Toronto Raptor bench were not enough for to push the Raptors over the line as they lost to the Detroit Pistons. Despite none of the starters scoring in double figures for the Pistons, Charlie Villanueva and Ben Gordon scored 19 points apiece to lead Detroit. Manu Ginobli the Super Sub had 20 points off the bench for the San Antonio Spurs as they increased their buffer as the number one overall seed in the playoffs with a win over the Cleveland Cavaliers. Kyrie Irving led the Cavaliers with 19 points. It’s amazing how injury can destroy a promising season. The Timberwolves are the epitome of this. Playing without Kevin Love and many other notable absentees, the Wolves put up a good fight but were defeated by the Golden State Warriors. Charles Jenkins had 24 points. JaVale McGee had 17 points as the Orlando Magic were held to just 30 points in the second half. Ryan Anderson had 24 points for the Magic to lead all scorers. Chris Paul had 33 points and 13 assists as the Clippers outscored the Hornets by 19 as they won by 9. With the win, the Clippers stay in the race for the top spot in the Pacific Division with the Lakers. 15/4/2012-Durant explodes as Rudy and the Grizz solidify playoff credentials. Chris Paul had 28 points and also handed at 13 assists in a win for the the Los Angeles Clippers as they defeated the Golden State Warriors. Despite having four players scoring 20 points or more including Nate Robinson’s 28 on return; without David Lee the Warriors were unable to get over the line. Luke Harangody had 16 points and 10 rebounds after being handed the start for the Cleveland Cavaliers, who won against the Washington Wizards. All five starters scored in double figures for the Cavs while Jordan Crawford had 19 for the Wizards. Kevin Garnett’s 21 points and 12 rebounds proved more than enough as the Celtics easily disposed of the New Jersey Nets. Rajon Rondo also had 14 assists to keep his streak alive. Rudy Gay’s 26 point 12 rebound double double combined with OJ Mayo’s 20 off the bench tore through the Utah Jazz as the Grizz won 98-103. Al Jefferson and Devin Harris had 20 points apiece. Kevin Durant and Russell Westbrook combined for 78 points as the Oklahoma City won against the Minnesota Timberwolves. Durant had 43 to lead the pair while trade bait Michael Beasley had 26 for the shorthanded Wolves. The Milwaukee Buck’s playoff hopes took a shot as they lost 105-99 against the Indiana Pacers. Monta Ellis had 20 points to lead the Bucks, but Roy Hibbert’s 23 points and a balanced Indiana attack came out on top. The Suns lost to the Spurs as Steve Nash did not register an assist. In the battle of the veterans, Tim Duncan had 19 to lead the Spurs while Sebastian Telfair’s 21 led all comers. Both Monta Ellis and Brandon Jennings flirted with triple doubles as the Milwaukee Bucks beat the Washington Wizards by 14. Jennings had 19 points, 7 assists and 6 rebounds while Monta had 17, 6 and 5. The Wizards proved once again unable to hold up over the stretch. Jordan Crawford led the Wiz with a game high 23 points. Goran Dragic had 21 points and Marcus Camby had 12 points and 11 rebounds as the Houston Rockets upset the Chicago Bulls 99-93, despite Luol Deng’s 24 points. 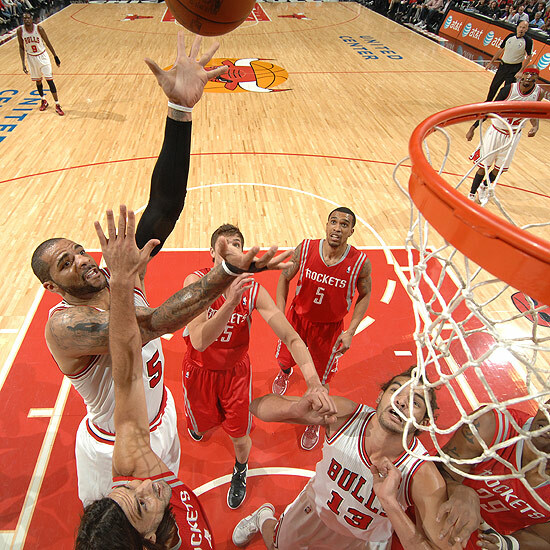 The Rockets shot 78 percent from downtown as they beat the Bulls in a big win for their playoff hopes. The Memphis Grizzlies halted the Oklahoma City Thunders winning streak at 6 games as 6 players scored in double figures. O.J Mayo had 22 points off the bench to lead both teams as the Grizzlies continue their push for a top four seed. Randy Foye’s 8 three pointers and 28 points along with Blake Griffins 15 points and 16 rebounds led the Clippers to a 19 point win over the Dallas Mavericks. The Mavs didn’t offer too much resistance, Nowitzki scoring 19 points to lead the Maverick team. Tyreke Evans had a near triple double with 24 points 10 rebounds and 7 assists as the Sacramento Kings dealt a big blow to the Wolves playoff hopes, winning by 8 in Sacramento. Kevin Love surprisingly failed to post a double double but still had 23 points for the TWolves. Paul Millsap’s efficient 31 point game on 14-20 points led the Utah Jazz over the Portland Trailblazers and Wes Matthews 33 points. LaMarcus Aldridge had 27 points in the loss, while Gordon Hayward had 20 points for the winners.